In the beginning, Father Aloysius Bittman bought a bug. That was in 1957 when he joined the staff of St. Anthony’s Indian Mission in Mandaree, North Dakota. Since then, Father Bittman has gone a long way. In 30 Volkswagens. Owning two or three at a time, the Bittman staff travels 600 miles per week in each. Over dirt and gravel roads and in temperatures that have been known to go to 55 below. 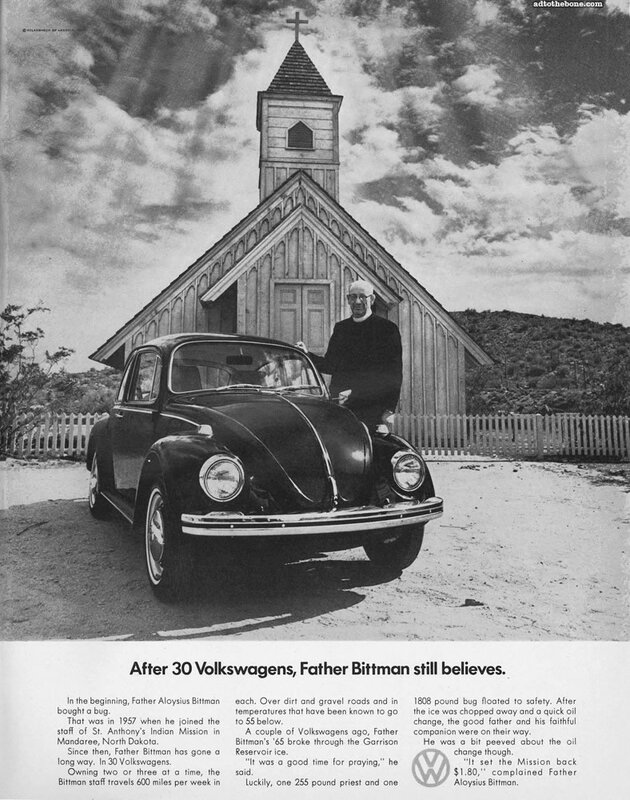 A couple of Volkswagens ago, Father Bittman’s ’65 broke through the Garrison Reservoir ice. “It was a good time for praying,” he said. Luckily, one 255 pound priest and one 1808 pound bug floated to safety. After the ice was chopped away and a quick oil change, the good father and his faithful companion were on their way. He was a bit peeved about the oil change though. “It set the Mission back $1.80,” complained Father Aloysius Bittman. Nice! Were you a bulb boy?